Over 37,000 faces of players and staff in standard cut-out style. Covers all playable leagues in Football Manager 2018 Mobile. Compatible with FM18. This facepack was created to be suitable for Football Manager Mobile 2018. However, FMM18 is now sharing the way graphics work on its bigger brother, which makes this pack compatible with Football Manager and Football Manager Touch for desktop as well. The megapack is put together by the FMM Vibe team, with permission by Sortitoutsi for using their source facepack. Vibe's megapack includes just over 37,000 faces of players and staff. The "Download Now" button will take you to their dedicated download page for it. Normally, this pack is locked for Vibe members-only; but there's now an exception for users going through fmscout, so you'll be able to get the free torrent download as a guest. Next to their green "Download" button (which is for their premium members), you will find a light grey button "or Download with Torrent?". That's the one you can get for free, as a guest. 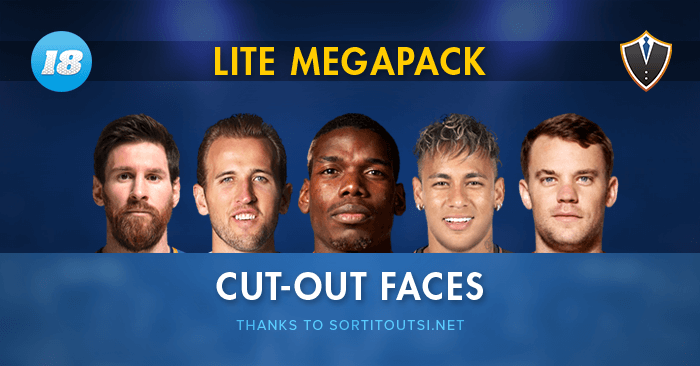 If you want the full cutout megapack with over 100,000 faces, you have to visit Sortitoutsi. However, be warned this requires membership. Create the folders "graphics" and "faces" if they don't exist. Open Football Manager 2018 (or Touch) and go to Preferences > Interface. Click the "Clear Cache" button. Return to the same screen. There should be a box that pops up saying 'loading image data for the new skin'. Once this is done action facepack should be working within the game. Instructions for how to install this on Android or iOS handheld devices (in case you have FMM18) can be found on FMM Vibe.